For other uses, see Stranger Things (disambiguation). The first season begins in November 1983, when Will Byers is abducted by a creature from the Upside Down. His mother, Joyce, and the town's police chief, Jim Hopper, search for Will. At the same time, a young psychokinetic girl called Eleven escapes from the laboratory and assists Will's friends, Mike, Dustin, and Lucas, in their own efforts to find Will. The third season is set a year later, in mid-1985, in the midst of the popularity of the film Back to the Future. Mike and Eleven have developed a relationship, as have Max and Lucas. Winona Ryder as Joyce Byers, the mother of Will and Jonathan Byers. She is divorced from Lonnie Byers. In season two, she is dating her old high school classmate, Bob, until his death later in the season. She and Hopper are suggested to have feelings for each other. David Harbour as Jim Hopper, chief of Hawkins Police Department. After his young daughter died of cancer, Hopper divorced and lapsed into alcoholism. Eventually he grows to be more responsible, saving Joyce's son as well as taking Eleven as his adopted daughter. It is suggested he and Joyce have feelings for each other. Finn Wolfhard as Mike Wheeler, son of Karen and Ted, younger brother of Nancy, and one of three friends of Will Byers. He is an intelligent and conscientious student and is committed to his friends. He develops romantic feelings for Eleven. Millie Bobby Brown as Eleven ("El"), a young girl with psychokinetic abilities and a limited vocabulary. Her real name is Jane, and she is the biological daughter of Terry Ives. After escaping from Hawkins Laboratory, where experiments were being performed on her, she befriends Mike, Dustin, and Lucas. She develops romantic feelings for Mike. Gaten Matarazzo as Dustin Henderson, one of Will's friends. His cleidocranial dysplasia causes him to lisp. In the second season, he is proud of his new front teeth and is attracted to Max. Caleb McLaughlin as Lucas Sinclair, one of Will's friends. He is wary of Eleven but later befriends her. In season two, he is one of Max's love interests. Natalia Dyer as Nancy Wheeler, daughter of Karen and Ted and older sister of Mike. In season one, she is Steve Harrington's girlfriend. In season two, she becomes Jonathan Byers' girlfriend. Charlie Heaton as Jonathan Byers, the older brother of Will Byers and the son of Joyce Byers. He is a quiet teenager, an outsider at school, and an aspiring photographer. He is close with his mother and brother, and he becomes the boyfriend of Nancy Wheeler. Cara Buono as Karen Wheeler, mother of teenaged Nancy, middle schooler Mike, and toddler Holly. Matthew Modine as Martin Brenner, the scientist in charge of Hawkins Laboratory. He is manipulative and remote. He and his team are searching for Eleven. He reappears in season 2 briefly. Noah Schnapp as Will Byers, the son of Joyce Byers and younger brother of Jonathan Byers. He is captured by a monster from the "Upside Down", an alternate dimension discovered by Hawkins Laboratory scientists. Schnapp was promoted to series regular for the second season, after recurring in the first. Sadie Sink as Maxine "Max" Mayfield, Billy's younger stepsister, and a tomboy who catches the attention of both Lucas and Dustin. She was introduced in the second season. Joe Keery as Steve Harrington, a popular high school student and the boyfriend of Nancy Wheeler. He ostracizes Jonathan Byers, but later comes to befriend him. He begins as Nancy's boyfriend but breaks up with her in season two. Keery was promoted to series regular for the second season, after recurring in the first. Dacre Montgomery as Billy Hargrove, Max's violent and unpredictable older stepbrother. He challenges Steve's popularity. He was introduced in the second season. Sean Astin as Bob Newby, a former schoolmate of Joyce and Hopper. In season two, he runs the Hawkins RadioShack and is Joyce's boyfriend, putting him at odds with Hopper. He was introduced in the second season. Paul Reiser as Sam Owens, a Department of Energy executive. He replaces Brenner as director of Hawkins Laboratory. He is stubborn and committed to scientific research, yet empathetic to the residents of Hawkins. He was introduced in the second season. Maya Hawke as Robin, an "alternative girl" bored with her job until she stumbles onto one of the secrets of Hawkins. She will be introduced in the third season. Stranger Things was created by Matt and Ross Duffer, known professionally as the Duffer Brothers. The two had completed writing and producing their 2015 film Hidden, which they had tried to emulate the style of M. Night Shyamalan, however, due to changes at Warner Bros., its distributor, the film did not see a wide release and the Duffer Brothers were unsure of their future. To their surprise, television producer Donald De Line approached them, impressed with Hidden's script, and offered them the opportunity to work on episodes of Wayward Pines alongside Shyamalan. The brothers were mentored by Shyamalan during the episode's production, so that when they finished, they felt they were ready to produce their own television series. "Montauk is an eight-hour sci-fi horror epic. 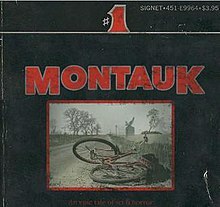 Set in Long Island in 1980 and inspired by the supernatural classics of that era, we explore the crossroads where the ordinary meet the extraordinary...emotional, cinematic and rooted in character, Montauk is a love letter to the golden age of Steven Spielberg and Stephen King – a marriage of human drama and supernatural fear." The series was originally known as Montauk, as the setting of the script was in Montauk, New York and nearby Long Island locations. The brothers had chosen Montauk as it had further Spielberg ties with the film Jaws, where Montauk was used for the fictional setting of Amity Island. After deciding to change the narrative of the series to take place in the fictional town of Hawkins instead, the brothers felt they could now do things to the town, such as placing it under quarantine, that they really could not envision with a real location. With the change in location, they had to come up with a new title for the series under direction from Netflix's Ted Sarandos so that they could start marketing it to the public. The brothers started by using a copy of Stephen King's Firestarter novel to consider the title's font and appearance, and came up with a long list of potential alternatives. Stranger Things came about as it sounded similar to another King novel, Needful Things, though Matt noted they still had a "lot of heated arguments" over this final title. To pitch the series, the Duffer Brothers showcased images, footage and music from 1980s films such as E.T. the Extra-Terrestrial, Close Encounters of the Third Kind, Poltergeist, Hellraiser, Stand by Me, Firestarter, A Nightmare on Elm Street and Jaws, in order to establish the tone of the series. The idea of Stranger Things started with how the brothers felt they could take the concept of the 2013 film Prisoners, detailing the moral struggles a father goes through when his daughter is kidnapped, and expand it out over eight or so hours in a serialized television approach. As they focused on the missing child aspect of the story, they wanted to introduce the idea of "childlike sensibilities" they could offer, and toyed around with the idea of a monster that could consume humans. The brothers thought the combination of these things "was the best thing ever". To introduce this monster into the narrative, they considered "bizarre experiments we had read about taking place in the Cold War" such as Project MKUltra, which gave a way to ground the monster's existence in science rather than something spiritual. This also helped them to decide on using 1983 as the time period, as it was a year before the film Red Dawn came out, which focused on Cold War paranoia. Subsequently, they were able to use all their own personal inspirations from the 1980s, the decade they were born, as elements of the series, crafting it in the realm of science fiction and horror. Other influences cited by the Duffer Brothers include: Stephen King novels; films produced by Steven Spielberg, John Carpenter, Wes Craven, and Guillermo del Toro; films such as Star Wars, Alien, and Stand by Me; Japanese anime such as Akira and Elfen Lied; and several video games including Silent Hill, Dark Souls and The Last of Us. The Duffer Brothers also believe that they may have brought influences from other works unintentionally, including Beyond the Black Rainbow and D.A.R.Y.L., discovered by reviewing fan feedback on the series. Several websites and publications have found other pop culture references in the series, particularly references to 1980s pop culture. With Netflix as the platform, the Duffer Brothers were not limited to a typical 22-episode format, opting for the eight-episode approach. They had been concerned that a 22-episode season on broadcast television would be difficult to "tell a cinematic story" with that many episodes. Eight episodes allowed them to give time to characterization in addition to narrative development; if they had less time available, they would have had to remain committed to telling a horror film as soon as the monster was introduced and abandon the characterization. Within the eight episodes, the brothers aimed to make the first season "feel like a big movie" with all the major plot lines completed so that "the audience feels satisfied", but left enough unresolved to indicate "there's a bigger mythology, and there's a lot of dangling threads at the end", something that could be explored in further seasons if Netflix opted to create more. Regarding writing for the children characters of the series, the Duffer Brothers considered themselves as outcasts from other students while in high school and thus found it easy to write for Mike and his friends, and particularly for Barb. Joyce was fashioned after Richard Dreyfuss' character Roy Neary in Close Encounters of the Third Kind, as she appears "absolutely bonkers" to everyone else as she tries to find Will. 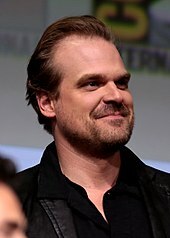 In June 2015, it was announced that Winona Ryder and David Harbour had joined the series as Joyce and as the unnamed chief of police, respectively. The brothers' casting director Carmen Cuba had suggested Ryder for the role of Joyce, which the two were immediately drawn to because of her predominance in the films of the 1980s. Levy believed Ryder could "wretch up the emotional urgency and yet find layers and nuance and different sides of [Joyce]". Ryder praised that the show's multiple storylines required her to act for Joyce as "she's out of her mind, but she's actually kind of onto something", and that the producers had faith she could pull off the difficult role. The Duffer Brothers had been interested in Harbour before, who until Stranger Things primarily had smaller roles as villainous characters, and they felt that he had been "waiting too long for this opportunity" to play a lead, while Harbour himself was thrilled by the script and the chance to play "a broken, flawed, anti-hero character". Additional casting followed two months later with Finn Wolfhard as Mike, Millie Bobby Brown in an undisclosed role, Gaten Matarazzo as Dustin, Caleb McLaughlin as Lucas, Natalia Dyer as Nancy, and Charlie Heaton as Jonathan. In September 2015, Cara Buono joined the cast as Karen, followed by Matthew Modine as Martin Brenner a month later. Additional cast who recur include Noah Schnapp as Will, Shannon Purser as Barbara "Barb" Holland, Joe Keery as Steve Harrington, and Ross Partridge as Lonnie, among others. Actors auditioning for the children roles read lines from Stand By Me. The Duffer Brothers estimated they went through about a thousand different child actors for the roles. They noted that Wolfhard was already "a movie buff" of the films from the 1980s period and easily filled the role, while they found Matarazzo's audition to be much more authentic than most of the other audition tapes, and selected him after a single viewing of his audition tape. As casting was started immediately after Netflix greenlit the show, and prior to the scripts being fully completed, this allowed some of the actor's takes on the roles to reflect into the script. The casting of the young actors for Will and his friends had been done just after the first script was completed, and subsequent scripts incorporated aspects from these actors. The brothers said Modine provided significant input on the character of Dr. Brenner, whom they had not really fleshed out before as they considered him the hardest character to write for given his limited appearances within the narrative. The brothers had desired to film the series around the Long Island area to match the initial Montauk concept. However, with filming scheduled to take place in November 2015, it was difficult to shoot in Long Island in the cold weather, and the production started scouting locations in and around the Atlanta, Georgia area. The brothers, who grew up in North Carolina, found many places that reminded them of their own childhoods in that area, and felt the area would work well with the narrative shift to the fictional town of Hawkins, Indiana. The filming of the first season began in November 2015 and was extensively done in Atlanta, Georgia, with the Duffer Brothers and Levy handling the direction of individual episodes. Jackson served as the basis of the fictional town of Hawkins, Indiana. Other shooting locations included the Georgia Mental Health Institute as the Hawkins National Laboratory site, Bellwood Quarry, Patrick Henry High School in Stockbridge, Georgia, for the middle and high school scenes, Emory University's Continuing Education Department, the former city hall in Douglasville, Georgia, the Georgia International Horse Park in Conyers, Georgia, the probate court in Butts County, Georgia, Old East Point Library and East Point First Baptist Church in East Point, Georgia, Fayetteville, Georgia, Stone Mountain Park, Palmetto, Georgia, and Winston, Georgia. Set work was done at Screen Gem Studios in Atlanta. The series was filmed with a Red Dragon digital camera. Filming for the first season concluded in early 2016. To create the aged effect for the series, a film grain was added over the footage, which was captured by scanning in film stock from the 1980s. The Duffer Brothers wanted to scare the audience, but not to necessarily make the series violent or gory, following in line with how the 1980s Amblin Entertainment films drove the creation of the PG-13 movie rating. It was "much more about mood and atmosphere and suspense and dread than they are about gore", though they were not afraid to push into more scary elements, particularly towards the end of the first season. The brothers had wanted to avoid any computer-generated effects for the monster and other parts of the series and stay with practical effects, so they created an animatronic to play the part of the demogorgon. However, the six-month filming time left them little time to plan out and test practical effects rigs for some of the shots. They went with a middle ground of using constructed props including one for the monster whenever they could, but for other shots, such as when the monster bursts through a wall, they opted to use digital effects. Post-production on the first season was completed the week before it was released to Netflix. The title sequence uses closeups of the letters in the Stranger Things title with a red tint against a black background as they slide into place within the title. The sequence was created by the studio Imaginary Forces, formerly part of R/GA, led by creative director Michelle Doughtey. Levy introduced the studio to the Duffer Brothers, who explained their vision of the 1980s-inspired series, which helped the studio to fix the concept the producers wanted. Later, but prior to filming, the producers sent Imaginary Forces the pilot script, the synth-heavy background music for the titles, as well as the various book covers from King and other authors that they had used to establish the title and imagery, and were looking for a similar approach for the series' titles, primarily using a typographical sequence. They took inspiration from several title sequences of works from the 1980s that were previously designed by Richard Greenberg under R/GA, such as Altered States and The Dead Zone. They also got input from Dan Perri, who worked on the title credits of several 1980s films. Various iterations included having letters vanish, to reflect the "missing" theme of the series, and having letters cast shadows on others, alluding to the mysteries, before settling into the sliding letters. The studio began working on the title sequence before filming, and took about a month off during the filming process to let the producers get immersed in the series and come back with more input. Initially they had been working with various fonts for the title and used close-ups of the best features of these fonts, but near the end the producers wanted to work with ITC Benguiat, requiring them to rework those shots. The final sequence is fully computer generated, but they took inspiration from testing some practical effects, such as using Kodalith masks as would have been done in the 1980s, to develop the appropriate filters for the rendering software. The individual episode title cards used a "fly through" approach, similar to the film Bullitt, which the producers had suggested to the studio. The Stranger Things original soundtrack was composed by Michael Stein and Kyle Dixon of the electronic band Survive. It makes extensive use of synthesizers in homage to 1980s artists and film composers including Jean-Michel Jarre, Tangerine Dream, Vangelis, Goblin, John Carpenter, Giorgio Moroder, and Fabio Frizzi. According to Stein and Dixon, the Duffer Brothers had been fans of Survive's music, and used their song "Dirge" for the mock trailer that was used to sell the series to Netflix. The Duffer Brothers discovered the band through the 2014 film The Guest, where Survive features on the soundtrack. Once the series was green-lit, the Duffer Brothers contacted Survive around July 2015 to ask if they were still doing music; the two provided the production team with dozens of songs from their band's past to gain their interest, helping to land them the role. Once aboard, the two worked with producers to select some of their older music to rework for the series, while developing new music, principally with character motifs. The two had been hired before the casting process, so their motif demos were used and played over the actors' audition tapes, aiding in the casting selection. The series' theme is based on an unused work Stein composed much earlier that ended up in the library of work they shared with the production staff, who thought that with some reworking would be good for the opening credits. In addition to original music, Stranger Things features period music from artists including The Clash, Joy Division, Toto, New Order, The Bangles, Foreigner, Echo and the Bunnymen, Peter Gabriel, and Corey Hart, as well as excerpts from Tangerine Dream, John Carpenter, and Vangelis. In particular, The Clash's "Should I Stay or Should I Go" was specifically picked to play at pivotal moments of the story, such as when Will is trying to communicate with Joyce from the Upside Down. The first season consisted of eight one-hour-long episodes which were released worldwide on Netflix on July 15, 2016, in Ultra HD 4K. The second season, consisting of nine episodes, was released on October 27, 2017 in HDR. The third season will once again consist of eight episodes, and is set to be released on July 4, 2019. The first season of Stranger Things was released on a Blu-ray/DVD combo pack exclusively to Target retailers on October 17, 2017, and the same for the 4K/Blu-ray combo pack on November 15, 2017, both of which includes vintage CBS-FOX VHS-inspired packaging. The second season received a similar release on November 6, 2018. Winona Ryder (left) was nominated for the Golden Globe, Satellite and Screen Actors Guild Award, while Millie Bobby Brown (right) was nominated for the Emmy Award and Screen Actors Guild Award for her work in the series. As Netflix does not reveal subscriber viewership numbers for any of their original series, Symphony Technology Group compiled data for the season based on people using software on their phones that measures television viewing by detecting a program's sound. According to Symphony, within the first 35 days of release, Stranger Things averaged ratings around 14.07 million adults between the ages 18–49 in the United States. This made it the third most-watched season of Netflix original content in the U.S. at the time behind the first season of Fuller House and fourth season of Orange Is the New Black. In a September 2016 analysis, Netflix found that Stranger Things "hooked" viewers by the second episode of the first season, indicating that the second episode was "the first installment that led at least 70 percent of viewers who watched that episode to complete the entire first season of a show." Review aggregator Rotten Tomatoes gave the first season an approval rating of 96% based on 82 reviews, and a weighted average rating of 8.04/10. The site's critical consensus states, "Exciting, heartbreaking, and sometimes scary, Stranger Things acts as an addictive homage to Spielberg films and vintage 1980s television." Review aggregator Metacritic gave the first season a normalized score of 76 out of 100 based on 34 critics, indicating "generally favorable reviews". On Rotten Tomatoes, the second season has an approval rating of 94% based on 139 reviews, and an average rating of 7.8/10. The site's critical consensus states, "Stranger Things' slow-building sophomore season balances moments of humor and a nostalgic sweetness against a growing horror that's all the more effective thanks to the show's full-bodied characters and evocative tone." On Metacritic, the second season has a normalized score of 78 out of 100, based on 33 critics, indicating "generally favorable reviews". 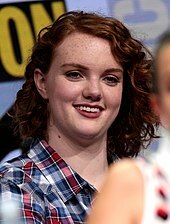 Shannon Purser's performance as Barb received a great deal of attention from fans, and led to her being nominated for Outstanding Guest Actress in a Drama Series. Shortly after its release, Stranger Things gained a dedicated fanbase. One area of focus from these fans was the character of Barb, the nerdy friend and classmate of Nancy who is taken and killed by the monster early in the season. According to actress Shannon Purser, Barb "wasn't supposed to be a big deal", and the Duffer Brothers had not gone into great detail about the character since the focus was on finding Will. However, many fans sympathized with the character, with Laura Bradley of Vanity Fair suggesting that these people found that Barb would be a similar misfit in society, and "looks more like someone you might actually meet in real life" compared to the other characters, particularly Nancy, in the series. Hashtags such as "#ImWithBarb" and "#JusticeforBarb" grew in popularity after the series' release, and several fan sites and forums were created to support her. While Purser did not return for the second season, the Duffer Brothers used the real-life "Justice for Barb" movement as inspiration for narrative at the start of the second season, with Nancy addressing the fact "that no one ever cares about" Barb. Purser and several media outlets took her nomination as Barb for Outstanding Guest Actress in a Drama Series in the 69th Primetime Emmy Awards as achieving "Justice for Barb", highlighting how well her character was received. Another impact of the series has been an increase demand for Eggo waffles, as they are shown to be Eleven's favorite food in several episodes and are seen as a representation of the series. The Kellogg Company, which manufactures Eggo, had not been part of the production prior to the first season's release, but recognized the market impact of the series. It provided a vintage 1980s Eggo television advertisement for Netflix to use in its Super Bowl LI commercial, and is looking to become more involved with cross-promotion. In April 2018, filmmaker Charlie Kessler filed a lawsuit against the Duffer Brothers, claiming that they stole his idea behind his short film Montauk for Stranger Things. Kessler's Montauk featured a similar premise of a missing boy, a nearby military base doing otherworldy experiments, and a monster from another dimension. Kessler has directed the film and debuted it at the 2012 Hamptons International Film Festival. During the 2014 Tribeca Film Festival, he pitched his film to the Duffer Brothers and later gave them "the script, ideas, story and film" for a larger film idea he called The Montauk Project for their review. Kessler contended that the Duffer Brothers used his ideas to devise the premise for Stranger Things without appropriate compensation and is seeking monetary damages. The Duffer Brothers' lawyer stated that the Duffer Brothers never saw Kessler's film nor spoke to him regarding it, and that Kessler had no input into their concepts for Stranger Things. Journalists have noted that the idea of supernatural events around Montauk had originated due to urban legend of the Montauk Project, which came to light from the 1992 book The Montauk Project: Experiments in Time. In September 2017, multiple media outlets published articles about a cease-and-desist letter sent by a Netflix in-house attorney to the operator of a Stranger-Things-themed pop-up bar in Chicago. The letter included humorous references to the series: "unless I'm living in the Upside Down"; "[w]e're not going to go full Dr. Brenner on you"; "the demogorgon is not always as forgiving." The letter also won praise from lawyers for its even-handedness in not demanding immediate closure of the bar but, instead, only demanding that the bar not remain open without Netflix's permission past its initial scheduled run. Stranger Things has received numerous awards and nominations across the entertainment industry, including ten Primetime Emmy Award nominations and four Golden Globe Award nominations through the second season. The series' cast has received several of these: the series' first season cast won the Screen Actors Guild Award for Outstanding Performance by an Ensemble in a Drama Series, while series leads Ryder, Brown, and Harbour have earned individual awards and nominations. With the release of the second season of the series, Netflix also released Beyond Stranger Things, an aftershow hosted by Jim Rash. The guests of the aftershow are composed of cast and crew from the series, including the Duffer Brothers and the series' stars, to discuss the development and behind-the-scenes production of the series and its larger mythology. Unlike previous aftershows created by Embassy Row, such as Talking Dead and Talking Bad, Beyond Stranger Things is intended to be watched after a screening of the entire current season. Penguin Random House partnered with Netflix to release a series of books related to Stranger Things, starting in late 2018. This includes a companion book to the series, Stranger Things: World Turned Upside Down: The Official Behind-The-Scenes Companion, a children's book that offers "advice, wisdom, and warnings" from Stranger Things, and a prequel novel penned by Gwenda Bond focused on Eleven's mother entitled Suspicious Minds. Additional books for adults and young readers are expected to follow. Hasbro published a licensed version of a Stranger Things-inspired Dungeons & Dragons starter kit in May 2019. The kit, besides including instruction books, character sheets and dice, includes a campaign "The Hunt for the Thessalhydra" which the children played in Season 1, as well as Demogorgon minifigs. Dark Horse Comics announced a partnership with Netflix for "a multi-year publishing line" of stories set in the Stranger Things world. The first title was a four-issue miniseries written by Jody Houser and interior art by Stefani Martino. The story took place during the events of season 1, showing Will's perspective throughout his time in the Upside Down. The first issue of the miniseries was released on September 26, 2018. The second Stranger Things title will be another four-part miniseries, written again by Jody Houser with interior art by Edgar Salazar, titled Stranger Things: Six. The comic will focus on one of the experiments preceding Eleven: a girl named Francine, who possesses powers of precognition. The first issue will go on sale May 29. Netflix and BonusXP developed a free mobile game tie-in for Stranger Things, released to iOS and Android devices on October 4, 2017. The game uses a retro-pixel style of art, similar to games for the Super Nintendo Entertainment System. The game is loosely based on the Stranger Things story after season one, with the player starting as Chief of Police Jim Hopper looking for the missing boys. Once these characters are found, they become playable and have special abilities that allow the player to access more areas in the game. BonusXP had less than a year to complete the game. The team decided to make the game in a similar style to The Legend of Zelda because it "was a perfect match because both [Stranger Things and Zelda] are about exploration, and it's kind of a mysterious fit that fit the mood of the show," according to BonusXP president Dave Pottinger. The map of Hawkins in the game was based on a Google street view map of Jackson, Georgia where the series is filmed. In order to help keep the game a secret, BonusXP did not hire game testers for their quality assurance, instead having family members from the design team provide feedback; this process helped create the two difficulty levels in the game. Completing the game gives players a clip from the first episode of the second season of the series. The game was downloaded 3 million times in the first week, becoming a top download and receiving critical praise. With the release of season two, an update to the game added Max as a playable character, and a release for the Amazon Fire TV, which included controller support. The game was nominated for "Mobile Game" at the 14th British Academy Games Awards. A second mobile game by BonusXP, Stranger Things 3: The Game, was announced during The Game Awards 2018; it will be released as a tie-in for Stranger Things's third season. Sony Interactive Entertainment has announced that it is working on a PlayStation 4-exclusive game, based on Stranger Things, for their PlayStation VR peripheral. The company has since released a teaser showing the Christmas-lights-on-a-wall scenes. In June 2018, Netflix announced plans for Telltale Games to produce an episodic adventure game based on the series, as part of a larger partnership that would see ports of other Telltale series as interactive movies on Netflix. However, the project was cancelled after Telltale laid off the majority of its staff in September 2018. United States Representative David Cicilline compared the state of the nation during the presidency of Donald Trump to that of Stranger Things during a speech given in Congress on February 16, 2017, using a sign "Trump Things" in the same format as the title card of the series and saying "Like the main characters in Stranger Things, we are now stuck in the Upside Down". As part of its release on Netflix on April 14, 2017, the cast of the rebooted version of Mystery Science Theater 3000 riffed on the first part of "Chapter 1" of Stranger Things. Google used augmented reality (AR) "stickers" of Stranger Things characters to introduce its ARCore technology announced alongside its Pixel 2 phone in October 2017. Sesame Street created a young audience-appropriate spoof of Stranger Things, called Sharing Things, released in November 2017; it featured Cookie Monster as the "Cookiegorgon", Grover as Lucas, Ernie as Dustin, and included several nods to the narrative of the second season. 1 2 3 Ausiello, Michael (June 15, 2015). "Scoop: Winona Ryder to Headline Untitled Netflix Supernatural Thriller". TVLine. Retrieved August 24, 2015. 1 2 3 4 5 6 7 8 9 Andreeva, Nellie (August 20, 2015). "Duffer Bros. Netflix Supernatural Drama Series Sets Young Cast, Gets Title". Deadline Hollywood. Retrieved August 24, 2015. 1 2 Petski, Denise (September 1, 2015). "Cara Buono Joins Netflix's 'Stranger Things'; Dean Cain In 'Lady Dynamite'". Deadline Hollywood. Retrieved July 17, 2016. 1 2 "Netflix's 'Stranger Things' Adds Matthew Modine to Cast (Exclusive)". TheWrap. October 27, 2015. Retrieved July 17, 2016. 1 2 3 4 5 6 Petski, Denise (October 14, 2016). "'Stranger Things' Netflix Series Adds Two New Regulars, Promotes Two For Season 2". Deadline Hollywood. Retrieved October 14, 2016. 1 2 Crossan, Ashley (August 31, 2016). "EXCLUSIVE: 'Stranger Things' Actor Joe Keery on Season 2, Steve's Hair and Justice for Barb". Entertainment Tonight. Retrieved January 2, 2017. 1 2 Schwindt, Oriana (November 7, 2016). "'Stranger Things' Season 2 Casts Sean Astin, Paul Reiser, Linnea Berthelsen". Variety. Retrieved November 8, 2016. 1 2 Longeretta, Emily (January 21, 2017). "'Stranger Things' Season 2 Scoop: Sean Astin Playing Winona Ryder's 'Boyfriend' & More". Hollywood Life. Retrieved January 25, 2017. ↑ Andreeva, Nellie (March 2, 2018). "'Stranger Things': Priah Ferguson Promoted, Maya Hawke Added As New Regular In Season 3 Of Netflix Series". Deadline Hollywood. Archived from the original on March 3, 2018. Retrieved March 3, 2018. 1 2 3 4 5 6 Foutch, Haleigh (April 21, 2018). "Exclusive: 'Stranger Things' Season 3 Starts Filming Monday; Andrew Stanton Not Returning". Collider. Retrieved April 22, 2018. 1 2 Wigler, Josh (December 31, 2018). "Netflix Reveals 'Stranger Things' Season 3 Premiere Date". The Hollywood Reporter. Retrieved January 1, 2019. ↑ Ramos, Dino-Ray (December 9, 2018). "'Stranger Things' Teases Titles For Season 3". Deadline. Retrieved December 9, 2018. ↑ Wigler, Josh (January 1, 2019). "Netflix Reveals 'Stranger Things' Season 3 Premiere Date". The Hollywood Reporter. Retrieved January 1, 2019. ↑ Mellor, Louisa (July 15, 2016). "Netflix's Stranger Things spoiler-free review". Den of Geek. Retrieved July 17, 2016. ↑ Sternbergh, Adam (August 20, 2017). "Turned Upside Down". Vulture. Retrieved August 22, 2017. 1 2 3 4 5 6 7 Grow, Kory (August 3, 2016). "'Stranger Things': How Two Brothers Created Summer's Biggest TV Hit". Rolling Stone. Retrieved February 6, 2017. 1 2 3 4 Cohen, Finn (August 14, 2016). "Matt and Ross Duffer Discuss 'Stranger Things,' a Nightmare on '80s Street". New York Times. Retrieved February 6, 2017. ↑ "16 Things You NEVER Knew About Stranger Things". CBR. November 12, 2017. Retrieved April 23, 2018. ↑ Berkshire, Geoff (July 22, 2016). "'Stranger Things': Shawn Levy on Directing Winona Ryder, Netflix's Viral Model". Variety. Retrieved September 15, 2016. 1 2 Spangler, Todd (April 2, 2015). "Netflix Orders 'Montauk' Supernatural Drama Series from 'Wayward Pines' Duffer Twins". Variety. Retrieved February 16, 2017. ↑ Andreeva, Nellie (April 2, 2015). "Netflix Orders Supernatural Drama Series From Matt & Ross Duffer, Shawn Levy". Deadline Hollywood. Retrieved April 3, 2015. 1 2 Miyamoto, Ken (October 26, 2017). "How to Sell Your TV Series the Stranger Things Way". Screencraft. Retrieved February 10, 2018. ↑ Andreeva, Nellie (April 2, 2015). "Netflix Orders Supernatural Drama Series From Matt & Ross Duffer, Shawn Levy". Deadline Hollywood. Retrieved September 15, 2016. 1 2 3 4 Fienberg, Daniel (August 1, 2016). "The Duffer Brothers Talk 'Stranger Things' Influences, 'It' Dreams and Netflix Phase 2". The Hollywood Reporter. Retrieved February 6, 2017. 1 2 3 4 5 6 Leon, Melissa (August 6, 2016). "Inside 'Stranger Things': The Duffer Bros. on How They Made the TV Hit of the Summer". The Daily Beast. Retrieved February 6, 2017. ↑ "Stranger Things is an Homage to the Greats". FrightFind. July 26, 2016. Retrieved July 26, 2016. ↑ Nassbaum, Emily (August 22, 2016). "On Television: "Stranger Things" and "The Get Down"". The New Yorker. Retrieved February 14, 2017. 1 2 3 "The Duffer Brothers Talk 'Stranger Things' Influences, 'It' Dreams and Netflix Phase 2". The Hollywood Reporter. 1 2 "The cinematic influences behind Netflix's 'Stranger Things'". ScreenerTV. July 18, 2016. ↑ "Yes, Stranger Things' Upside Down was totally inspired by Silent Hill". GamesRadar+. August 26, 2016. ↑ Tilly, Chris (August 26, 2016). "How Silent Hill, Dark Souls and The Last of Us Influenced Stranger Things". IGN. 1 2 Brinbaum, Debra (July 27, 2016). "'Stranger Things' EPs on Season 2: 'We Could Explore It If Netflix Wanted To'". Variety. Retrieved February 14, 2017. 1 2 3 4 5 Thrower, Emma (July 27, 2017). "Stranger Things: the Duffer brothers share the secrets of their hit show". Empire. Retrieved February 9, 2017. ↑ McClendon, Lamarco (July 26, 2016). "'Stranger Things': Winona Ryder Discusses First Major TV Role in Netflix Featurette". Variety. Retrieved February 10, 2017. ↑ Wilstein, Matt (August 9, 2016). "'Stranger Things' Star David Harbour's Long, Dark Road to Leading Man". The Daily Beast. Retrieved February 10, 2017. ↑ Coates, Tyler (August 1, 2016). "This 19-Year-Old Unknown Actress Just Became an '80s Cult Icon". Esquire. Archived from the original on August 4, 2016. Retrieved August 4, 2016. ↑ Petski, Denise (September 1, 2015). "Ross Patridge Joins cast of Stranger Things". Deadline Hollywood. Archived from the original on August 8, 2016. Retrieved August 4, 2016. ↑ A., Jonathan (July 19, 2016). "Netflix's Atlanta Filmed 'Stranger Things' Looks Amazing". Project Casting. Retrieved September 15, 2016. 1 2 Gross, Dough (July 19, 2016). "New Netflix Show 'Stranger Things' Films in Georgia". The Wrap. Retrieved September 15, 2016. ↑ "'Stranger Things' shoots on Jackson square". Jackson Progress-Argus. November 24, 2015. Retrieved July 11, 2017. ↑ Stamp, –Elizabeth (August 4, 2015). "Stranger Things's Filming Locations Are Just as Spooky in Real Life". Architectural Digest. Retrieved September 15, 2016. 1 2 "Georgia Locations for Netflix's 'Stranger Things'". Deep South Mag. July 28, 2016. Retrieved January 1, 2017. ↑ "50 Things You Didn't Know About 'Stranger Things'". Harper's BAZAAR. November 6, 2017. Retrieved April 23, 2018. ↑ "'Stranger Things': How the Duffer Brothers created their monster". EW.com. Retrieved April 23, 2018. ↑ Ferrell, Sean Patrick (August 11, 2016). "How the Stranger Things Titles Came Out So Perfectly Retro". Wired. Retrieved February 11, 2017. ↑ Perkins, Will (August 9, 2016). "Stranger Things (2016)". Art of the Title. Retrieved February 9, 2017. 1 2 3 4 Kaufman, Gil (August 29, 2016). "Stranger Things Co-Composer Shares the Story Behind 2016's Most Unlikely Musical Sensation". Billboard. Retrieved August 31, 2016. ↑ "Stranger Things: 10 eerie electronic gems to hear if you loved the Netflix show". FACT Magazine: Music News, New Music. Retrieved September 5, 2016. 1 2 3 Weingarten, Christopher (August 1, 2016). "'Stranger Things': Meet the Band Behind Show's Creepy, Nostalgic Score". Rolling Stone. Retrieved February 10, 2017. ↑ Gruttadaro, Andrew (August 2, 2018). "How the Duffer Brothers Picked the Perfect Music for 'Stranger Things'". Complex. Retrieved October 21, 2018. ↑ Thomas, Helen. "An Interview With S U R V I V E: The Mysterious Band Behind The Epic 'Stranger Things' Score". NME. Retrieved September 5, 2016. ↑ Mylnar, Phillip (July 25, 2016). "Unpacking the '80s nostalgia of the 'Stranger Things' soundtrack". Mashable. Retrieved February 10, 2017. 1 2 Minsker, Evan (August 10, 2016). "Netflix's Stranger Things Soundtrack Detailed". Pitchfork. Retrieved August 19, 2016. ↑ de Moraes, Lisa (January 17, 2016). "Netflix Unveils Premiere Dates For 'Orange Is The New Black,' 'The Get Down,' 'Flaked' And Others". Deadline Hollywood. Retrieved January 2, 2017. ↑ Harnick, Chris (July 11, 2017). "Stranger Things Season 2 Premiere Date, Huge Monster Threat Revealed". E! Online. Retrieved July 11, 2017. ↑ "Stranger Things". Netflix. Retrieved January 2, 2017. ↑ Wampler, Scott (October 5, 2017). "Looks Like Stranger Things Is Coming To Blu-Ray, After All". Birth.Movies.Death. Retrieved October 12, 2017. ↑ Squires, John (October 12, 2017). ""Stranger Things" Season 1 Getting VHS-Style Blu-ray Release at Target". Bloody Disgusting. Retrieved October 12, 2017. ↑ Holloway, Daniel (August 25, 2016). "'Stranger Things' Ratings: Where Series Ranks Among Netflix's Most Watched". Variety. Retrieved August 26, 2016. ↑ Butler, Bethoine (September 23, 2016). "'Stranger Things' won over most viewers in just two episodes, according to Netflix". Washington Post. Retrieved February 6, 2017. ↑ "Stranger Things: Season 1 (2016)". Rotten Tomatoes. Retrieved November 22, 2018. ↑ "Stranger Things: Season 1". Metacritic. Retrieved August 17, 2016. ↑ "Stranger Things: Season 2 (2017)". Rotten Tomatoes. Retrieved November 22, 2018. ↑ "Stranger Things: Season 2". Metacritic. Retrieved November 6, 2017. ↑ Hogan, Michael (December 17, 2016). "Shannon Purser: 'People have actually had Barb's face tattooed on their bodies'". The Guardian. Retrieved February 12, 2017. ↑ Bradley, Laura (August 24, 2016). "How the Internet Made Barb from Stranger Things Happen". Vanity Fair. Retrieved February 7, 2017. ↑ Jensen, Erin (July 13, 2017). "#JusticeForBarb: Stranger Things Shannon Purser receives Emmy nomination". USA Today. Retrieved July 14, 2017. ↑ Hoffman, Ashely (August 24, 2016). "Why Eleven From Stranger Things Is the Perfect National Waffle Day Mascot". Time. Retrieved February 14, 2017. ↑ Sloane, Garrett (February 6, 2017). "Eggo's Role In 'Stranger Things' Turns Into Free Super Bowl Mention With More To Come". Advertising Age. Retrieved February 14, 2017. ↑ Evans, Greg (April 3, 2018). "Duffer Brothers Accused Of Lifting 'Stranger Things' From 2012 Short Film". Deadline Hollywood. Retrieved April 3, 2018. 1 2 Roberts, Jeff John (September 20, 2017). "Netflix Sends Cool Cease-and-Desist Letter". Fortune. Retrieved September 3, 2018. ↑ Bloom, Mina (September 18, 2017). "Netflix Ends Unauthorized 'Stranger Things' Bar With A Super Classy Letter". dnainfo. Retrieved September 1, 2018. ↑ Evans, Greg (June 8, 2018). "'Stranger Things' Books Set For Fall Debut From Penguin Random House". Deadline Hollywood. Retrieved June 8, 2018. ↑ Macy, Seth (February 13, 2019). "Preorder This Awesome Stranger Things D&D Starter Set Right Now". IGN. Retrieved February 13, 2019. ↑ Holub, Christian (June 18, 2018). "Dark Horse launches line of 'Stranger Things' comics". Entertainment Weekly. Retrieved June 20, 2018. ↑ McMillan, Graeme (September 25, 2018). "'Stranger Things' Comic Trailer Explores Season 1 Mystery". The Hollywood Reporter. Retrieved September 26, 2018. ↑ Holub, Christian (February 20, 2019). "New Stranger Things prequel comic will introduce one of Eleven's fellow test subjects — exclusive". Entertainment Weekly. Retrieved February 20, 2019. ↑ "Stranger Things #1". Dark Horse Comics. Retrieved December 10, 2018. ↑ "Stranger Things: The Other Side". Amazon. Retrieved February 20, 2019. ↑ "Stranger Things #2". Dark Horse Comics. Retrieved December 10, 2018. ↑ "Stranger Things #3". Dark Horse Comics. Retrieved December 10, 2018. ↑ "Stranger Things #4". Dark Horse Comics. Retrieved December 10, 2018. 1 2 Gallagher, Danny (October 27, 2017). "How an Allen Studio Won the Contract to Make the Top-Secret Stranger Things Game". Dallas Observer. Retrieved October 31, 2017. ↑ deAlessandri, Marie (March 15, 2018). "Hellblade: Senua's Sacrifice at forefront of BAFTA Games Awards nominations". MCV. Retrieved March 16, 2018. ↑ Makedonski, Brett (April 12, 2018). "BAFTA names What Remains of Edith Finch its best game of 2017". Destructoid. Retrieved April 13, 2018. ↑ Palladino, Valentina (December 7, 2018). "Stranger Things 3 mobile game will let you jump into new Hawkins madness". Ars Technica. Retrieved December 7, 2018. ↑ Makuch, Eddie (November 2, 2017). "PS4's PlayStation VR Getting Stranger Things Experience, See A Teaser Here". ↑ "Netflix to still produce Stranger Things game despite Telltale collapse". Polygon. Retrieved October 1, 2018. ↑ Farokhmanesh, Megan (April 15, 2017). "Mystery Science Theater 3000 perfectly dunks on Stranger Things". The Verge. Retrieved April 15, 2017. ↑ Lenker, Maureen Lee (November 27, 2017). "Sesame Street parodies Stranger Things with Cookiegorgon". Entertainment Weekly. Retrieved December 1, 2017.